Roof overhangs behave differently in Revit when they occur over different thicknesses of walls. In this post, I’m speaking about residential projects, such as a single-family home. I’m assuming the use of wood framing and rafter-type roof construction. 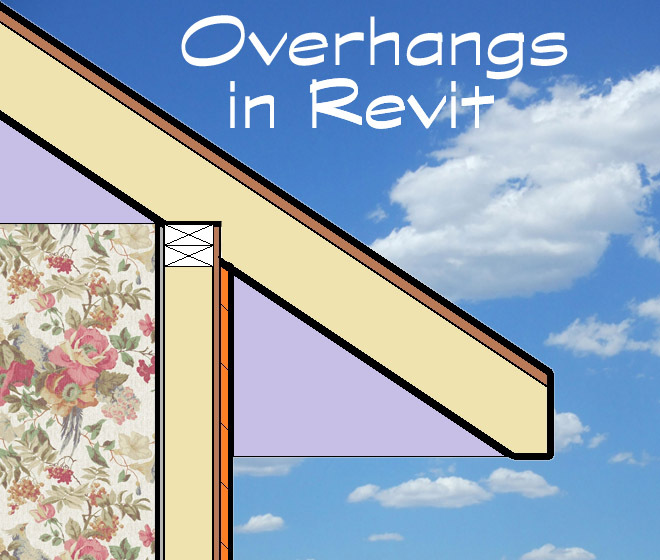 Revit gives us some great tools for creating and modifying roof overhangs. Primary among these tools is the Pick Walls tool, which is available when you are in Sketch Mode and you are creating the edges of the roof footprint. See the red arrow to the right in the image below. The Pick Walls tool justifies and constrains the roof’s edge to the supporting wall below. One big advantage of this parametric relationship between the wall and the roof is that the overhang can be controlled easily by changing the settings in the properties box and the options bar. Often, builders or owners will specify that a house will have different wall materials on different sides of the house. For example, the situation might call for brick on the front face of the house, and a less expensive material such as siding or stucco on the sides and rear. This post explores the effect of different types of wall finish materials on the overhang of the roof. The words in the Option Bar are not as self-explanatory as they could be. Let’s clarify what the two options (checked and unchecked) mean. 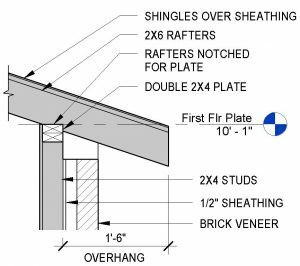 The first option (if the box is checked) means that the Overhang dimension that you set (say, eighteen inches) will be measured from the exterior face of the studs out to the ends of the rafters. 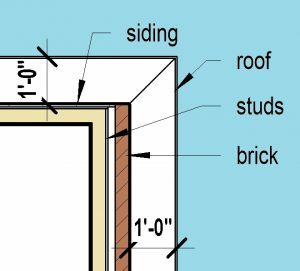 The second option (if the box is unchecked) means that the specified Overhang dimension will be measured from the exterior finish face of your wall, out to the rafter ends. The wall section above-right, which by the way is from my recently-published book, Residential Roof Design using Autodesk Revit, shows an overhang of one foot, six inches. This is measured from the exterior face of the wall’s studs, telling us that the Extend into wall (to core) option was checked. If that option were not checked, the measurement would be taken from the exterior face of the brick veneer, and it would be much less than one foot, six inches. Probably more like one foot, zero. Think about it– keeping the overhang dimension the same, if you choose “Extend into wall,” the overhang, as seen from outside of the house, will get shorter. Extending it makes it shorter… OK, I think I’ve got it now. When the measurement extends into the wall (to core), the framing of the overhang is not affected by the thickness of the exterior finish material of the wall. If one side of the house is brick, and another side is siding, the framing in both areas would be the same. However, the visible part of the overhang, as viewed by a person walking by, would appear to be different between the two sides. It would be appear to be wider on the side with siding, and narrower on the side with brick. See Ceiling Plan 1, at left. Now let’s look at the other option: Do not extend into wall (to core). Now the option box is unchecked, and the overhang measurement is taken from the exterior finish face of the wall. The overhang dimension is one foot, zero inches on all sides. In this option, the rafter length would have to change–the rafters would be longer at the brick-faced wall, and shorter at the siding-faced wall. However, our friendly passerby would see consistent widths of overhangs on all sides. See Ceiling Plan 2, at right. But here’s the kicker. Assume the builder follows standard procedure and sets the hip rafter over the exact corner point where the two stud walls meet. The eave along the brick-faced wall will be lower (closer to the ground) than the eave at the siding-faced wall! Not good. The reason is that the rafters must extend a longer horizontal distance from the stud wall at the brick-faced wall. As they extend outward, they drop lower! This assumes that the roof slope is the same on all sides of the house. If you vary the roof slopes very carefully, you could get the eaves to come out at exactly the same height. Another way to make the eaves come out at the same height is to move the hip rafter away from the corner of the wall framing. This is the condition that is shown in Ceiling Plan 2. Imagine the hip line in Ceiling Plan 2 extending up to the roof’s peak. It does not pass over the corner of the wood stud walls. I pity the unfortunate builder who is asked to work out the framing for this option! Yes, it can be done. Will it come out perfectly when built? Maybe, but I wouldn’t bet on it. The take-away is this. I recommend that designers always use the “Extend into wall (to core)” option. This is the best choice if your intention is to create a buildable roof. 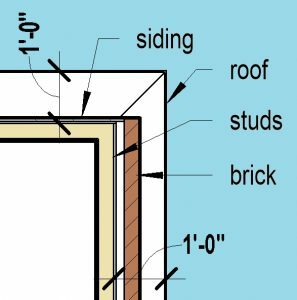 The “unchecked” option (measure overhang to the exterior wall’s finish face) may make sense from the viewpoint of the casual passer-by, but it can create serious framing issues when it comes time to build the roof. By the way, I apologize for the floral wallpaper, I just couldn’t resist.